The Commander Hotel was constructed in 1927, and functioned as a hotel under this name until approximately 2004/2005. It is described at metrohistory.com as "73rd St, 238-244 W, 16-sty bk hotel, 80x92, NB# 264-27, cost $650,000, owner 240 West 73d St. Inc., pres, Henry V. Singh 215 W 75th, architect Leo F. Knust 369 Lexington av." The original owner was the builder / real estate developer, Henry U. Singhi (1862-1946). Singhi was born in Rockland, Maine, 1 August 1862, and died in New York, 10 February 1946. In Polk's New York City Directory 1933-34 officers at the Commander Hotel were Henry Singhi and his daughters, Carrie E. Singhi and May S. Breen. Henry Singhi was recorded in the 1930 and 1940 U. S. Census reports, living in the Commander Hotel, 240 W. 73rd St. In 1962 the New York Times, 29 June 1962, reported, "The Commander Associates Company has leased the sixteen-story and penthouse Commander Hotel at 240 West Seventy-third Street to the Commander Hotel Affiliates, Inc., a group headed by Hugo Wolff. The building contains 306 rooms." 22 Nov. 1998 the New York Times ran a story about welfare hotels that included, "Property Markets Group, which is five years old, has four S.R.O. 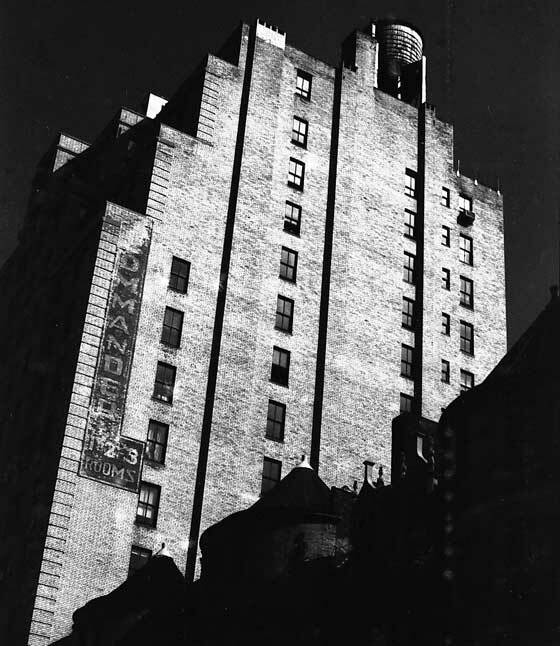 's among the 75 rent-regulated buildings it owns in Manhattan: the Broadway American, the Commander on West 73rd Street, the Martha Washington on East 29th Street and the Allerton House for Women on West 57th Street. It is now converting two, the Broadway American and the Allerton, to midpriced hotels..."
Currently (Sept. 2013) StreetEasy.com reports that the building is now known as the Tempo, which is owned by AIMCO 240 West 73rd Street, and has 217 apartments. Active rental listings average $2369. Apparently before being renamed the Tempo, the Commander was called Central Park Apartments. A bedbug report can be found at http://registry.bedbugs.net. In April 2012 The Tempo was found in violation of state law that does not allow hotel guests in the same building with permanent residents. Nypress.com has the story. The name Woogo Central Park - Tempo Apartments was used for hotel guests. The architect, Leo Frederick Knust (1876-1946), is credited with five New York City buildings at the architecture website en.phorio.com. With the exception of the Commander all are residential apartment buildings. The Office for Metropolitan History adds one additional building to this list: 135 E. 39th St., also residential apartments. In the 1900s Knust had a partner Floyd L. Robinson in the firm, Robinson & Knust. The New York City Landmarks Preservation Commission Report, Upper West Side / Central Park West Historic District Designation Report, 24 April 1990, says, "Leo F. Kunst (1876-1946) / 11-17 West 69th Street / 12-20 West 96th Street / Little is known of Leo Frederick Knust. He was working as an architect in New York by 1899, became a member of the American Institute of Architects in 1923, and practiced through 1932. Kunst was active in apartment house design on Manhattan's Upper West Side."